When computing began, software was freely shared amongst users. People were glad to create programs that others found useful and encouraged others to modify that software and share it freely. Now, most people consider software to be something that must not be shared and can only be modified by the original developer. This paradigm shift has caused great harm to a technology that thrives on community involvement and innovation. Proprietary software takes away control from the users and puts it in the hands of the developers, creating a dangerous situation where the developers are able to exert control over the users, often in an unethical manner. For instance, the Amazon Kindle contains a "backdoor" which allows Amazon to remotely delete books from a Kindle. This backdoor was unknown until it was first used in 2009 to delete copies of George Orwell's 1984 without asking for consent. The Kindle is not the only case of proprietary software invading privacy. Programs such as RealPlayer and Microsoft Windows include similar features that should be of concern to all users. We must not accept software that invades our privacy. 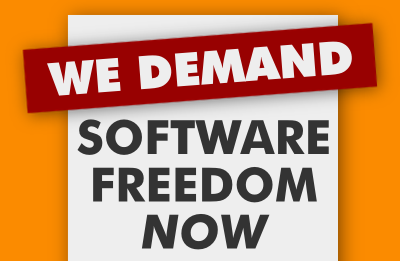 We must demand software freedom now! The damage done by proprietary software is not irreversible. Now, with free software, we can take back control of our computing. There are now thousands of free software applications available, many of which may be familiar to people, such as Mozilla Firefox and OpenOffice.org. These individual projects each contribute to the free software community and are integral parts of modern free operating systems, such as GNU/Linux.